Definition: For a graph $G = (V(G), E(G))$, a Component is a maximally connected subgraph of $G$. Essentially, you can think of a component as a puzzle piece to the entire graph. 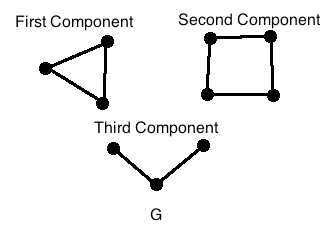 Note that if a graph is connected then it contains only $1$ component. Hence, a graph that has more than $1$ component implies that the graph itself is disconnected.